A bicycle covered with ash lies outside a house affected by the eruption of the Fuego volcano at San Miguel Los Lotes in Escuintla, Guatemala, June 6, 2018. There was no time to eat. Sunday family lunches were interrupted, the food left on the table. Children abandoned toys, and clothes still hung on lines in backyards. Animals died petrified. Guatemalan authorities reacted slowly to signs of the Fuego volcano's impending eruption on June 3, contributing to one of the most tragic natural disasters in recent Guatemalan history. But with the mountain's rumbles and the first ash showers, many villagers made a fatal bet to stay put, gambling that luck that had protected them for decades would hold once again. In the afternoon things took a turn for the worse. Tons of ash propelled by scalding, toxic gases poured down Fuego's flanks. These "pyroclastic flows" hit much faster, more lethal speeds than lava, dragging trees and giant rocks down onto villages in their path. 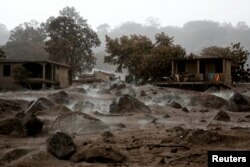 Volcanic rocks are spread around an area that got buried after the eruption of the Fuego volcano at San Miguel Los Lotes in Escuintla, Guatemala, June 6, 2018. "My family was having lunch, they left the plates of food and stopped eating and fled," said Pedro Gomez, a 45-year-old welder. "They took nothing but their clothes on their backs." 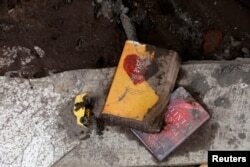 Books and a toy lie on the ground at a house affected by the eruption of the Fuego volcano in San Miguel Los Lotes in Escuintla, Guatemala, June 8, 2018. At least 110 people have died and close to 200 are thought buried under the rubble in the hamlet on the fertile lower slopes of the volcano. Fuego - Spanish for "fire" - rises between the regions of Sacatepequez, Escuintla and Chimaltenango about 30 miles (50 km) from Guatemala City, the nation's capital. 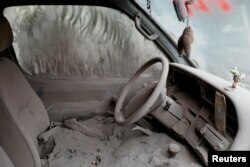 A car is seen covered in ash after the eruption of the Fuego volcano at San Miguel Los Lotes in Escuintla, Guatemala, June 10, 2018. "I took out the pickup truck and escaped with a lot of neighbors when we saw the smoke," said Alejandro Velasquez, 46, a farmer. Many lost 10 to 50 relatives each, descendants of intertwining generations of a small families who settled in Los Lotes more than 40 years ago. They refuse to give up hope of finding relatives - or at least their remains. "My entire family is missing," said Jose Ascon. The young man argued with police who had temporarily halted rescue efforts after more flows from the eruption. "I would give my life to find my family."